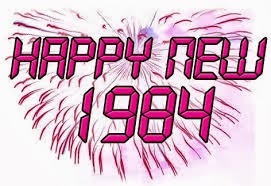 FELIZ 1 9 8 4! ¿Y si, así porque sí, hacemos de cuenta que es 1984 de vuelta? 1984 fue el año de Culture Club y "Karma Chameleon", Wham!, Ghostbusters, Footloose, Cindy Lauper y su "Girls Just Want to Have Fun", Paul McCartney y Michael Jakcson juntos con "Say, say, say", Van Halen con "Jump", Yes y "Owner of a Lonely Heart", Lionel Ritchie y su "Hello" (auxilioooo!). También Phil Collins con "Against All Odds" (suspiro! ), Bruce y su "Dancing in the Dark "(yeah!) o Tina Turner con "What´s Love Got to Do With It". Todo esto, treinta años atrás. Ese año, también escuchaba a Charly con Piano Bar, Fito con Del 63, G.I.T, Las Viudas, Virus, Zas, Los Twist, Alejandro Lerner, Los Abuelos de la Nada, Sandra Mihanovich, Piero... A fin de 1983 había regresado la democracia al país y, como diría Fito había "otra música en el aire". ¿Y vos, qué escuchabas? ¿Qué leías? ¿Qué comías? ¿Qué películas viste? ¿Por quién suspirabas? Felicidades, chicos! Y si se les quedó algo por hacer en 1984, nunca es tarde. Have you planned to move to Hyderabad? But, how confused will you manage and organize everything in order to move your goods to a new destination safely? There is a simple solution available to this confusion and it is Packers and Movers Hyderabad. By walking to the professionals, you can be stress-free when it comes to the safe movement of your goods. Check out the list of 11 common mental health disorder in children that a parent should know and find the Best Neurologist in Delhi. The best moving experience that I have with packers and movers in ahmedabad is awesome. They were right on time and price was exactly as discussed. They cleared out my 2 bedroom apartment in about an hour and a half. They made the painful task of moving a breeze. His crew were nothing short of miracle workers. They even moved my old furniture out to my buildings trash room. I would definitely recommend them and use them next time I have to move. I love your post here is more information for us thanks for sharing with us. Really impressive post. I read it whole and going to share it with my social circles. I enjoyed your article and planning to rewrite it on my own article.